We are rapidly approaching the 400th anniversary of the origin of porcelain production in Japan – first produced in 1616 in Arita. In the 1640s, however, a significant technological improvement occurred through Chinese influence. The technique of overglaze enameling (painting with coloured enamels over the glaze on the porcelain’s surface, with the vessel refired at lower temperatures) was introduced via Nagasaki. It is thought that the Japanese Arita-based potter, who was taught the original overglaze enamel technique by a Chinese master, was Sakaida Kakiemon I. 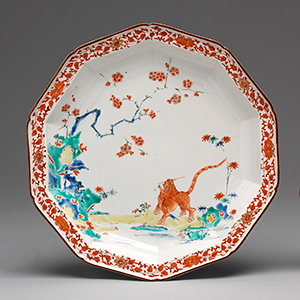 What we now recognise as classic Kakiemon- style porcelain was made in the period 1660–1700. The delicate colours and the creamy white body of these wares were much coveted in Europe despite their high cost. This talk will reassess the importance of Kakiemon style ware in light of recent scholarship and excavated material. Nicole Coolidge Rousmaniere is the Founding Director of the Sainsbury Institute and Professor of Japanese Art and Culture at the University of East Anglia. She is currently seconded to the British Museum as IFAC Handa Curator of Japanese Art in the Department of Asia. Her current research includes completing a manuscript for the British Museum Press entitled Four Hundred Years of Japanese Porcelain based on the British Museum holdings, to be published this year.